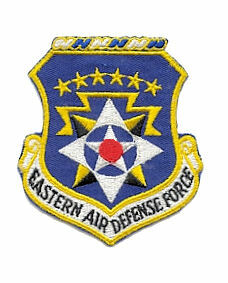 The Eastern Air Defense Force (EADF) is an inactive United States Air Force organization. Its last assignment was with Air Defense Command being stationed at Stewart Air Force Base, New York. It was inactivated on July 1, 1960. EADF was an intermediate-level command and control organization of Air Defense Command. Its origins date to 1 March 1949 when Continental Air Command (ConAC) reorganized Air Defense Command when it became an operating agency. Air defense units within the Continental United States (CONUS) were given to the Eastern and Western Air Defense Liaison Groups, with Western and Eastern Air Defense Forces activated on 1 September 1949. The command was originally assigned the region within the Continental United States (CONUS) to the east of the 102d degree of longitude, along the Canada–US border to the most easternmost point of Maine; the southern boundary being the 102d degree of longitude along the Rio Grande boundary with Mexico, east to the southernmost point of Texas and along the Gulf of Mexico and Atlantic Ocean coastlines. This was adjusted in 1951 with the activation of Central Air Defense Force (CADF) with the region being adjusted to the area east of the 90th degree of longitude south to the point of the Missouri, Kentucky and Tennessee state boundaries, and eastward to the Atlantic Ocean coastline along the Tennessee/Kentucky and Virginia/North Carolina border, with all areas north and east of those boundaries. Organizations stationed west and south of that delineation were transferred to CADF. Eastern Air Defense Force was inactivated on 1 July 1960, with its assigned units reassigned either to 26th, 30th or 32d Air Divisions, or to the new Air Defense Sectors created with the advent of the Semi Automatic Ground Environment (SAGE) system.